Jotun Paints, "The launch of SeaQuan- tum heralds a breakthrough in tin-free antifouling systems: Jotun's new coating has undergone extensive testing and offers up to five years of effective pro- tection against fouling on ship bottoms." A revolutionary approach to the cost effective solution to problems associated with spills, cargo loss and environmental damage prevention and control. The leader in deck hardware for over 60 years. Circle 304 on Reader Service Card ered a practical tin-free solution suitable for virtually any application. SeaQuantum — holding properties that bear chemical and physical properties - that are almost uncanny to tin-based antifouling coatings. In translation, the product blends protection against foul- ing with a hydrolysis reaction, making the vessel's bottom increasingly smooth as the coating wears — creating a more efficient vessel. The company recom- mends the product be applied to both newbuilds and full bottom upgrades. Jotun. 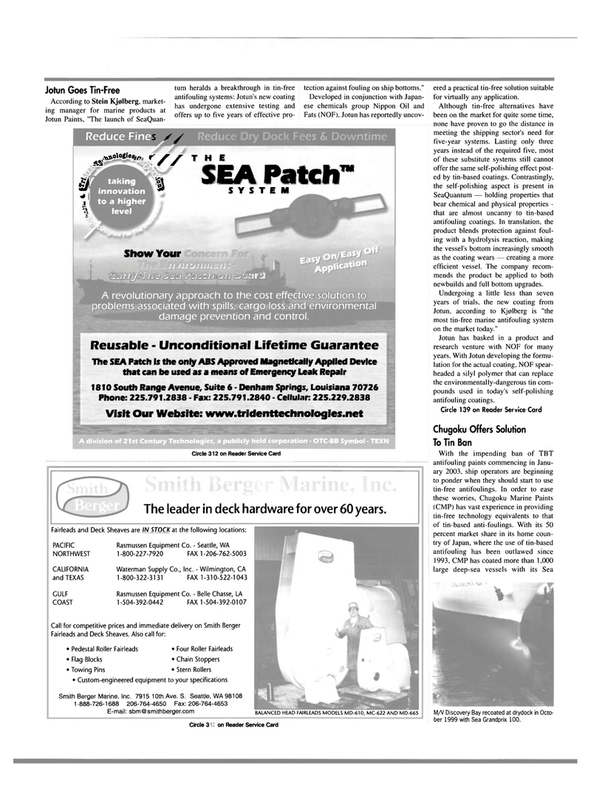 according to Kj0lberg is "the most tin-free marine antifouling system on the market today." Jotun has basked in a product and research venture with NOF for many years. With Jotun developing the formu- lation for the actual coating, NOF spear- headed a silyl polymer that can replace the environmentally-dangerous tin com- pounds used in today's self-polishing antifouling coatings. M/V Discovery Bay recoated at drydock in Octo- ber 1999 with Sea Grandprix 100.